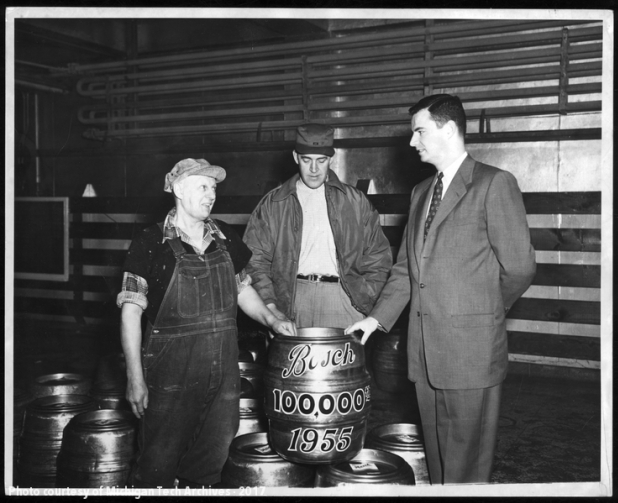 Showing off the 100,000th keg of Bosch beer, December 1955. Joseph Bosch, founder of the Bosch Brewing Company, had always yearned to enter the brewing industry. He had learned much from his father, a brewer in his native country of Germany, who had brought the family to Lake Linden, Michigan in 1867. A desire for more knowledge and experience led the young Bosch to Cleveland, Fort Wayne and finally Milwaukee, where he worked for the Schlitz brewery. He returned to Lake Linden in 1874, erected a small wooden building and began brewing operations as the Torch Lake Brewery, Joseph Bosch & Company. Bosch operated the brewery on his own for the first two years, but in 1876 admitted several men on a partnership basis. The company continued as a partnership until around 1894, when the reorganized firm issued stock under its new name, the Bosch Brewing Company. The company continued in operation for nearly a century, closing the last of its facilities in 1973. In the early years of brewing in Michigan’s Upper Peninsula, little if any beer was sold in bottles. Bosch saw the potential of this packaging, however, and the company began bottling on a small scale before 1880. By 1883, the original wooden building in Lake Linden had been enlarged and the company was producing 4,000 barrels of beer annually, one quarter of which was bottled. The brewery was completely destroyed in a great fire that swept through Lake Linden in 1887, but the demand for its product fired quick construction of new facilities. By the turn of the century the Bosch Brewing Company had brewing facilities in Lake Linden and Houghton, as well as branches and storehouses in Calumet/Laurium, Hancock, Eagle Harbor and Ishpeming. Having survived the difficult years of prohibition, the company finally closed the Lake Linden facility in favor of the better-situated facilities in Houghton. Stressing the relationship of its product and the community, the Bosch Brewing Company featured many local themes in its advertising. Promotional phrases such as the “Refreshing as the Sportman’s Paradise” kept the small brewery close to the hearts of Copper Country natives and visitors from farther afield. The company found itself increasingly unable to compete locally with the larger breweries of Milwaukee and St. Louis, however, and the last keg of beer was ceremoniously loaded onto a wagon for delivery to a local tavern on Friday, September 28, 1973. Flashback Friday: Ice Out, Shanties In!